We offer a premium Taxi services, Mini Van and Mini Bus services in the North part of Corfu island, making your transfer from Corfu international airport or from Corfu Port, to your destination, easy and safe. Our professional drivers ensure to make your trip pleasant and comfortable. After your flight, our chauffeur will be waiting to welcome you at the airport terminal and help you carry your luggage to the car, before he leads you towards your destination. Our professional drivers are locals, so they know all the different routes towards your destination ensuring that they will take the one that is the most comfortable and quick, being always safe and enjoyable at the same time! 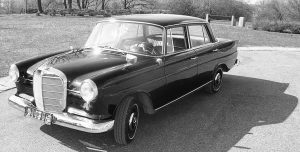 In 1962, my grandfather Vasileios Rouvas started with a Mercedes W110 Taxi to providing his services at the north part of Corfu. My father George was the next generation to continue the Taxi transfers and now here I am! The new generation. With my team Ι develop and run a company by today’s European standards, new automobiles and reliability, succeeding a unique combination, in North Corfu, of a Transfer Agency with its own Official Taxi! Based in Arillas we are one of the oldest and most trusted in Taxi services in North west Corfu. We achieved and maintain a perfect cooperation with many Hotels, famous Meditation Clubs (Buddha Hall), festivals (Gayatri, Corfu Beer) and numerous of accommodations and travel agents of Arillas and the rest North part. Each year we provide more than 1000 rides and maintain a customer satisfaction rate of 100%. That’s what makes us More Than Just a Ride. When you email us, we answer immediately back.>One of our trained dispatchers will always be at your disposal! Our vehicles are all eco friendly and full insured according the European Standards. We know all the destinations and accommodations you are asking for. We all speak english and we are all locals! We will drive you direct to your destination stress-free, completely safe and happy! Join us and experience an enjoyable transfer.